The iPhone 5s is a smartphone that is in many ways better than its predecessor, and one of the upgrades it brings along is the improved 8MP camera. Yup, the resolution hasn't been boosted, but other aspects of the snapper itself have been tweaked, including those larger, 1.5-micron pixels and that wider, f/2.2 aperture. As a result, the camera should perform better, especially in low light situations. However, are the photographic skills of the iPhone 5s on par with those of the competition? Well, that's what we're here to find out. For today's camera comparison, we have chosen to stack up Apple's finest against some of the top smartphones out there. Among them is the LG G2, which has already proven itself as a very capable shooter with its 13MP OIS camera, grabbing the first prize in our previous challenge. Of course, Samsung's best handsets, namely the Galaxy S4 and the Galaxy Note 3, are also in the game and will defend the company's reputation with their 13MP cameras. And to make things even more interesting, we've brought along the HTC One with a 4MP, optically stabilized UltraPixel camera, as well as the Motorola MOTO X and the Motorola DROID Ultra, both packing 10MP Clear Pixel cameras. So yeah, the fight will be pretty tough. Let's get straight into it! Note: the Panasonic Lumix GH2 is used as a reference camera. Thankfully, the weather and lighting conditions during our testing were favorable, allowing all of the smartphones to present us with the best results they could achieve. And the ones that gave us the best impression were the LG G2 and the Samsung Galaxy S4, which packed tons of details in their photos. They weren't leading by miles, however. Daytime photos taken with the LG G2 and Samsung Galaxy S4 look great even at 100% zoom, so we can comfortably examine even the fine details in them, such as the leaves on trees or the license plates of passing cars. The iPhone 5s and the Galaxy Note 3 photos look very detailed as well, but still, they are a step behind the G2 and the S4. Also, we see that, as usual, the iPhone's photos are noisier than what we're used to seeing. Photos taken with the Motorola MOTO X, DROID Ultra, and HTC One are usable, but their detail levels are average at best. Nevertheless, the images they produce are perfectly suitable for uploading to a social network and even making small prints. 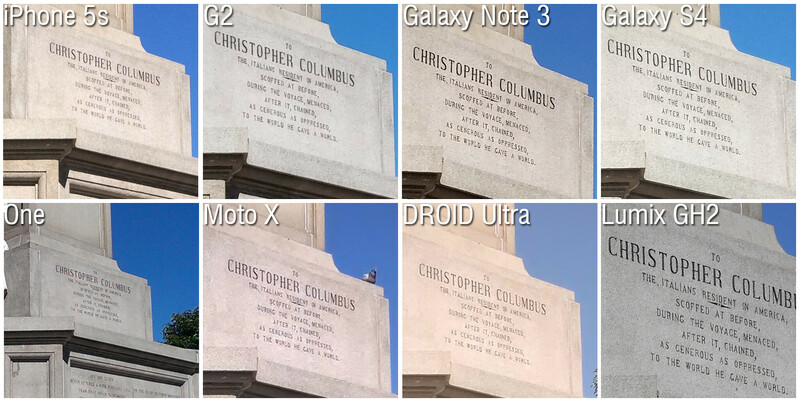 Actually, the first iPhone picture is about as blurry as swamp water - I can't make out anything under Christoper Columbus. Galaxy Note 3 and Lumix GH2 are clearest. But, go ahead and keep fantasizing. Well, no disrespect, you either need glasses or a new monitor, cause I can see every single letter and detail. I think they should redo the night test with the iPhone 5S. There is clearly some sort of backlight in the photo (most likely from a car's headlights as evident by the shadow you see). This could give results that are different than if that car wasn't there. So, if they car weren't there shining a light you really wouldn't be able to see anything in the pic - isn't that called CHEATING Dr. Phil? Just another sponsored article by LG, nothing to see here. Why the hate? Camera comparisons aren't sponsored, it's just a comparison. I'm pretty sure that you won't say that if the Note 3 wins this comparison. I agree. PA made this so LG would look good and pay them more. And I only say this because we all saw the G2 get destroyed yesterday in the blind comparison. You forgot to include the Z1. They wouldn't want anyone beating the G2! LG is Phonearena's biggest sponsor. Where's Lumia 1020 and Xperia Z1? I think the 1020 is out of question, because it performes so much better than the others that it wouldn't be a fair comparison. The Z1 is a more interesting one, wondering why they left it out of the article. LOL! Nah, read comment #7. I would definitely add the z1 but not the Nokia 1020. The 1020 is a year old phone with a great camera attached to it. No different if Sammy was to add a great camera to a year old S3. Plus where do you draw the line? What if you add the perfect camera to a 2 year old Galaxy S2? So you're saying that the 1020 isn't qualified to compete with the other cameras, even though it's better than all of them by an impassable gulf, because it's an old phone? The tech may not be impressive, but neither is the Moto X or the iPhone, and they do just fine. Also, the 1020 was release in the US in late July 2013, so less than three months old here. Sounds like you just don't like getting smacked around. 1020 is a good backup camera and good call quality, it ends there. Well wouldn't it be quite a fair comparison because the iPhone 5S is basically a year-old phone with a fingerprint sensor added onto it? You have to include the best phone camera into a comparison of phone cameras. I would agree this accurate. I agree. But I heard that Note 3 has a toggle "Smart stabilization"used for taking low light photo, and we have to toggle in unlike built in as G2. PA can you check it? An excellent and well balanced camera comparison by PA! Butthurt sammities attacking in 3..2..1..
Why butthurt. I think well done. :) Don't be so...idk lol.